A group of young artists from Cape Dorset have left their mark on the walls of Montreal, with a massive colourful mural that speaks about the impact of climate change on Inuit. The mural on Rue Ontario East is the Embassy of Imagination’s second project in the south. 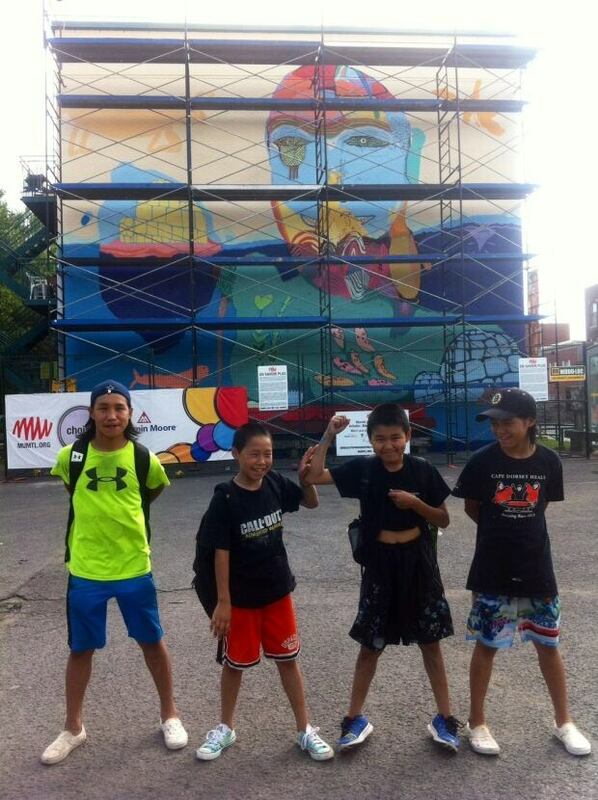 Last year, the Cape Dorset-based youth art group created a mural in Toronto, their first foray out of Nunavut. “I’m going to remember this for a long time, because I’m enjoying it here,” said 14-year-old artist Saaki Nuna in Inuktitut. The other three artists working on the mural are Tommy Quvianaqtuliaq, Johnny Samayualie, and Salomonie Ashoona. The four are joined by mentors Susan Rowsell and Parr Josephee, who was part of the group that painted the Toronto mural last summer during the Pan Am Games. The youth, who come from a Baffin Island community of about 1,200, say painting on a three-storey building has been an eye-opening experience for them.